Jake Arnott’s ‘The Fatal Tree’ is a ripping new 18th century yarn of London lowlife on the make and take, trying to stay one step ahead of the Fatal Tree itself (the gallows of Tyburn). It uses the story of Jack Sheppard and more importantly the lesser-known Edgworth Bess, his woman, who led a ‘wicked and debauched life’ to take a gloriously filthy trawl through the muck and smoke of the city with the buttocks (female prostitutes), stallions (pimps) and natty-lads (young thieves) of Old London. The narrative is peppered with slang that reminds you how this punky underbelly of London has always been with us, up to the new rhyming slang of present day crews. The language requires concentration, but there’s a glossary of terms at the back which fits everything together. The past should always feel like another country, and so it is in ‘The Fatal Tree’, colourful and pungent in a way few historical fictions are. Arnott catches the unsentimental bluntness of lives lived fast and short, and the tale is as knotted, rambunctious and teeming with life as a Hogarth print. It has always been suggested that the thief and gaol-breaker Jack Sheppard was the inspiration for John Gay’s Macheath. Despite managing to stay alive for just 22 years he was seen as a heroic figure for centuries, for his energetic attempts to escape from prison as much as his crimes. Thinking about him sent me back to the wonderful (and out of print) ‘Mr Gay’s London’ by AP Herbert, which contains extracts from London court proceedings. One of the reasons why thieves so feared the rope was because there was such a high likelihood of it awaiting them; if you committed burglary it was said that you put people ‘in Fear of the Highway’, so the value of what you stole was not taken into account and no jury could save you. Ebenezer Dun was hanged for breaking and entering the house of one Sarah Loyzada and stealing ‘4 Pewter-dishes, a Stew-pan, a Sauce Pan and a Coffee Pot’. Joseph Fretwell was hanged for stealing threepence. Two further thieves were hanged for taking rice, prunes and two ounces of Stone Blue (which I presume to be tobacco). At the end of typical court sessions there was a list; 87 prisoners tried, 6 hanged, 2 burnt in the hand, 40 transported, 2 imprisoned and 1 in the pillory plus 7 years transportation – just for perjury. Both books are worth seeking out for anyone interested in flash London, in fact and fiction. Trivia note: Jack Sheppard was played by Tommy Steele in the film version ‘Where’s Jack?’ and Kenneth Williams turns up with Laurence Olivier in the film version of Gay’s ‘The Beggar’s Opera’. “Jack Shepard” was also a bestseller by Dicken’s rival and friend Harrison Ainsworth, one of his typical historical potholes. AP Herbert =>Misleading Cases! Cheque written on a cow etc. Alistair Sim as the judge. Bloody hell that’s a fair old court list ! What’s that just the morning sitting ? I bet the magistrates really got in the mood for serious justice during the p.m. session. No messing with them lads. As perjury could get someone hanged or transported, it was pretty serious. Jonathan Wild, the Thief-taker General who finally got Sheppard convicted, arranged to have criminals who didn’t pay him off hanged through perjury. It was easier than showing they’d committed a real crime. Macheath was a highwayman – much higher up the criminal pecking-order than a mere house-breaker – so Sheppard probably didn’t have much to do with his creation. As Peachum was inspired by Walpole as well as Wild, perhaps Macheath also had a political “original”. http://www.fromoldbooks.org/Farmer-MusaPedestris/ has a selection of canting songs in criminal slang. The version of Hogarth’s Gin Lane you have here looked a bit odd, and after a bit of Googling I realised it is reversed from the most common version. However, both have the names over the doors the correct way round, but are otherwise identical. Most curious! I thought there was something odd about the engraving, but if I stared at it all morning, I don’t think I would have noticed it was back to front. There is apparently a plaque on the ground where Tyburn gallows were. I have wandered all around Marble Arch area and Bayswater Road without finding it. Also, luckily, without being run over. Any clues? I spotted a plaque pictured towards the end of this post. 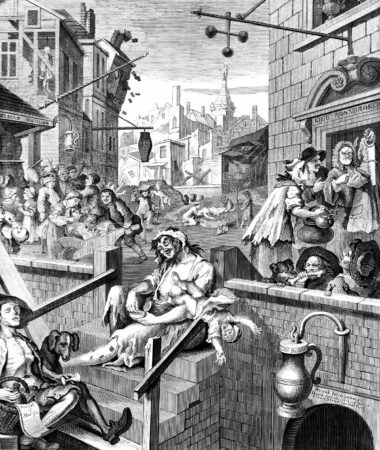 The Hogarth Gin Lane is another version – I have several versions of it in my Hogarth book. The triangular Tyburn gallows plaque is near Speakers Corner and the arch itself, and is boringly small and unexciting – head toward the traffic and you’ll find it in the pavement. I haven’t seen this wall-mounted one; it must be new. Vivienne – from memory I think the Tyburn plaque is on the triangular pedestrian island at the junction of Bayswater Rd and Edgware Rd. I’m going to Tottenham Court Road later so if I get time I’ll pop down the other end of Oxford St and have a look. Yes Chris the plaque in the pavement is just where u r describing it. Perjury was deemed such a serious offence because of the taking of the oath – it wasn’t just telling lies it was swearing to God you would tell the whole truth and nothing but and then lying upon THAT word/ sacred oath. To contravene that oath was a terrible thing. The hanging tree was in the end not just a tree it was a weird old construction built to carry out multiple hangings. As you can see from the sessions list featured by Chris the judiciary was all for getting on with the job and as the hangings were a popular form of public entertainment hangings unless for particularly notorious criminals was carried out on an almost industrial scale. If you look at the old engravings of the Tyburn tree it was a bit like the Paramount picture logo a triangle with hanging at about three or four different levels. I might be wrong but I think they could hang 15 to 40 in one go. As Chris states in his reply to Vivienne’s query the pedestrian island at Marble Arch is an obvious triangle. Wearing my earth mysteries hat the representation of the triangle really is expressed in this small area of London . The Ziggurats on the Churchill estate nearby – the oddly shaped blocks of flats. The shape described by the major roads the Edgware Road, Marble Arch The shape of the triangle is there. When you read about the route taken from Newgate to Tyburn the prisoners about to be hanged having a beer bought for them in the area which is Now New Oxford Street near j/w Tottenham Court Road then carrying on down Oxford Street to the place of execution. You wonder exactly how old that l way might be. I wonder if it was an ancient processional way. Just a thought. Churchill estate to west of Edgware Road north of Bayswater Road. If you leave Marble arch behind head west toward Bayswater and this convent faces the park. The narrowest house is, if memory serves, in the same terrace. For some reason best know to computer experts I seem to have morphed into Jane in the above post. Just Tweeted a couple of photos I took earlier today of the Tyburn plaque. I think the blog site referenced by Mr. Bellew is in error in one respect. Going west goes back before Tyburn, I believe. The West has always been the land after death. Wasn’t it only traitors that were drawn and quartered? Their hangmen must have been pretty ignorant – or cruel – for the condemned to take any length of time to die. The drawing was fascinating, though, and I like the idea of a Tyburn fishing club.